Sometimes you just have to make your own mistakes and make your own experiments before you believe a result that someone else has already warned you about. That and I really just want to piece my (other) quilts in my own room, around my own things, which leads me to procrastinate on this current project. This quilt was supposed to be a quick quilt to get me to practice the FMQ, and that is starting to serve it’s purpose this early morning. My experiment & hypothesis: I can FMQ through a freezer paper quilting template and still like the quilting results on the quilt when the freezer paper is removed. First I took a paper copy of my design (Just ran the freezer paper copy through my printer) and pinned it down to the top of a practice quilt sandwich. I quilted through that. First, I locked up & realized how much lint is gathering under my metal plate, so spent a half hour ‘delinting’ my machine. After all is lint free, I try again with the regular paper. I suppose this was my ‘control’ of my experiment. To see if freezer paper would be easier than the regular paper. Regular paper quilts through mostly fine, although at this point, I haven’t removed the regular paper yet, so this data is only halfway done. Then decided I needed more time getting the rhythm for the design down, so I cut a smaller sandwich for the middle design & quilted it down. So I took freezer paper and put it on my practice quilt sandwich and FMQ’d away. 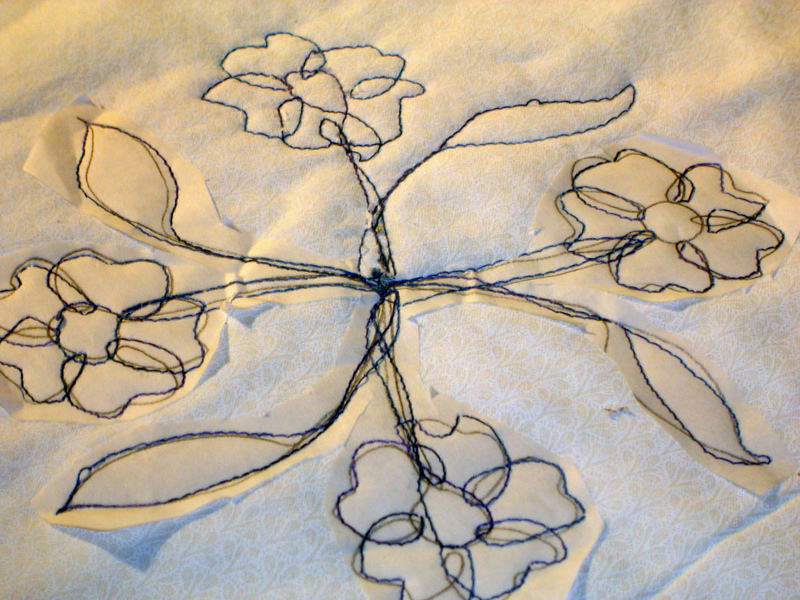 I have only removed the paper from one of the flowers and leaves at this point, and although this technique I think would work, I am having reservations at how much this is pulling up the stitches. One solution: faster foot pedal, slower hands. I am not sure but maybe a tighter tension would produce tighter stitches on the top. Another solution: get the freezer paper wet with water to help remove the paper. Another solution: get a light weight quilting paper specially designed to dissolve away. This would help with keeping the stitches close to the actual fabric underneath, perhaps also providing more tension all on it’s own. I don’t own any of this. Another solution: trace the design from paper to the fabric using dressmaker’s carbon. This way I don’t have to deal with the paper itself. Of course I don’t OWN any dressmaker’s carbon. Another solution: trace the design onto tissue paper. Same as the carbon, and I may actually have some. somewhere. Somewhere.Tissue paper’s thin. May come with its own set of problems too though. Another option: leave it – it’s working out ok enough. I think this may work overall, if I decided to leave the freezer paper & tear it out by hand, I think this could be “good enough” and know that over time, I’ll get better. And hopefully the recipient would understand. I realized that I never have come to this place before in my stages of quilting. Which solution / option do you usually chose? Reasons why? Hi Darla! I think it’s an awesome quilting design and you’ve certainly laid out quite a lot of potential solutions using a marked pattern and various materials. Will you try them all? 1. Print your design on regular paper, and tape it to a glass door (or light box) and layer the quilt on top. If the light is bright enough you should be able to mark the design on the surface of your quilt. 2. Print your design on regular paper and use it as a reference to free hand draw the design on the surface of your quilt. This might sound scary, but it’s actually very forgiving if you use a pencil or chalk that brushes off easily. 3. Print many copies of the design and practice tracing it over and over until you can see it in your sleep. Mark a few registration lines on your quilt, just general locations for how the design should line up on the quilt surface (i.e: circle for a flower, leaves should reach x, etc), then free motion the design according to those registration lines. Again, this sounds harder than it is and will allow you to quilt without any paper or major marks, but it also won’t result in a “perfect” carbon copy of your design. I hope this all makes sense! You’ve certainly gotten me thinking about many different marking methods and I look forward to more of your experiments! I’ve used regular paper and tissue paper–for me, the tissue paper is far preferable. Easier to trace the designs, and easier to remove once used. Right now, I’m using some Golden Threads quilting paper I inherited from my Mom. It feels pretty similar to tissue paper. I’ll be reviewing it once I’m finished actually using it. I’ve never tried dissolving paper, mostly because I’m usually making wallhangings that I don’t really intend to wash. If you ever try that I’ll be interested to read your experiments! Darla, they make a special paper for this – Golden Threads. It is sold on a roll, and is a tissue paper, but stronger than the stuff you would buy for gift wrapping. It tears away without pulling out your stitches, but you still need to pick smaller bits out with tweezers. You could print your design out on regular paper, then staple it to the top of several sheets of Golden Threads paper – then stitch around with no thread in your machine to punch the design on all of the sheets of Golden Threads. I’ve done that an it works well. Drawing right on the GT paper is not a great idea, as I have had pencil marks transfer to the fabric as I stitch. I also once tried the freezer paper and found that it pulled on the stitches too much. Washing helped but didn’t completely fix it. Once, rather than buy Golden Threads, I used single ply paper napkins. Easy to trace through, easy to sew through. I think the problem was that I adhered them to the quilt top w/ spray adhesive and such w/ glue stick. This turned out to be a dIsaster. After stiching about a hundred roses, the paper did not want to come off in the intricate corners. Three washings and a lot of picking later I had it pretty well off. On light colored fabrics I trace the design through my make-shift light box if I plan ahead before the quilt is sandwiched. Otherwise I draw or print my designs on tag board and trace around them (love ceramic pencils for dark fabrics. Sometimes I use I make registration lines like Leah suggested and draw or freehand the quilting from there. This really my favorite if I can do it. I have also cut motifs from Contact paper and quilted around the edges. Loving all the ideas. I have never done any with paper. I have always stcuk to easy motifs that I can either make up as I go or that I can stick with just a few reference lines marked on the quilt. I really enjoy your solutions. Thanks for sharing here and via podcasts! Darla, I have read that you can use netting or another holey fabric to draw out your pattern and then put it on your quilt and trace the design onto the quilt – kind of like you had a stencil, but easier to make. I haven’t tried it yet, but it makes sense to me.easier to trace on the netting than using a window or a light box.